Today I had a need to have a perl script (running on CentOS 5.4) connect to a MSSQL Server 2008 Std server so i had to do a little research and playing around. The solution to getting everything working with “Free/OpenSource” stuff was not difficult if you don’t follow everything that everyone publishes. I have provided the steps I used below to get everything working. Updated step 5 on Sep 11, 2012 with a note that reflects the findings of user xtruthx. Before you start you need to ensure you know how to satisfy all the RPMs in the pre-requisites. Location from where you can get the RPMs is listed in parentheses (). Steps to get MSSQL,ODBC and Perl working as one happy product. How did I get ODBC setup? Then install the perl, perl-DBI if you don’t have them installed already. If you haven’t downloaded the perl-DBD-ODBC module you can do so using wget/curl/etc. I prefer wget. Then install the perl-DBD-ODBC module. I am assuming the perl-DBD-ODBC is in the same directory you are working in. If not you will need to provide a complete path to the rpm. What ODBC drivers have I got? Here, /etc/odbcinst.ini defines the ODBC drivers. Configure unixODBC to use FreeTDS as the Driver for the MSSQL connection. First we need to locate the driver file. Now we know where the source files are so lets create a driver template to use for driver installation. You can use vi if you want, but to make sure people can copy/paste as much as possible I have provided an echo command below. Adjust the path and possibly filename for “/usr/lib/libtdsodbc.so.0”. Note: Only use the driver that has a single 0 if there is more than one returned like my example. Now lets install the driver from the template. This will install the driver so anyone can use this driver. If you check to see what drivers are available to ODBC you will now see “FreeTDS” has been added. 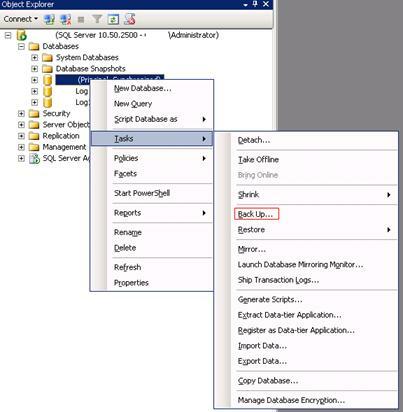 Configure ODBC with MSSQL parameters. To do this we need to modify the /etc/odbc.ini file. Your odbc.ini file could be in a different location. use odbcinst -j to location your ini file. You need to adjust the values accordingly for the echo command to work for your install. You will want to be root to do the file modification. I jump to root by way of sudo su -. 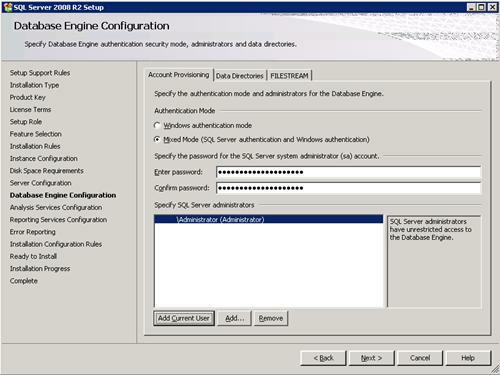 Note:You will need a SQL user account setup in MSSQL to allow you to connect remotely with the way I am showing you.Note: A user (xtruthx) has reported that “TDS Version” needed an underscore in order to work for his setup. The user used “TDS_Version = 8.0” instead of what is in the example below. Test the ODBCconnect to your MSSQL database. If the step above was successful then lets try using a Perl script. Note: Below I specify DSN=MSSQL, that should match the name in [ ] in your odbc.ini file. You will also want to change SQLUSERNAME and SQLUSERNAMEPASSWORD to your username/password needed to connect to MSSQL using SQL username/password. This is NOT windows authentication. External Reference links used to get everything working. 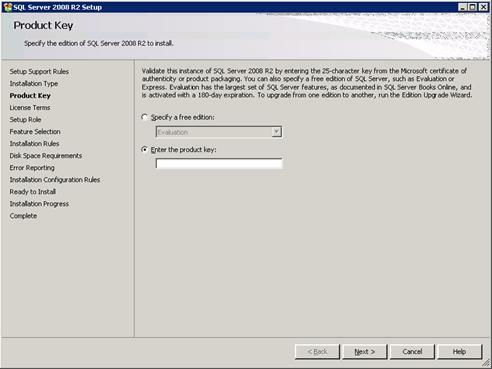 How to setup MSSQL Server 2008 R2 for High Availability using mirroring. 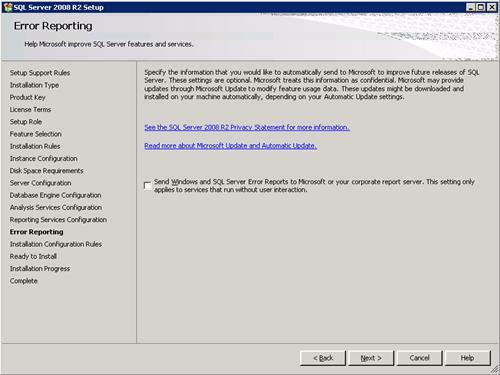 Microsoft MSSQL Server 2008 R2 can be setup in a High Availability model in a few different ways. The simplest way to this with two server is to use database mirroring. 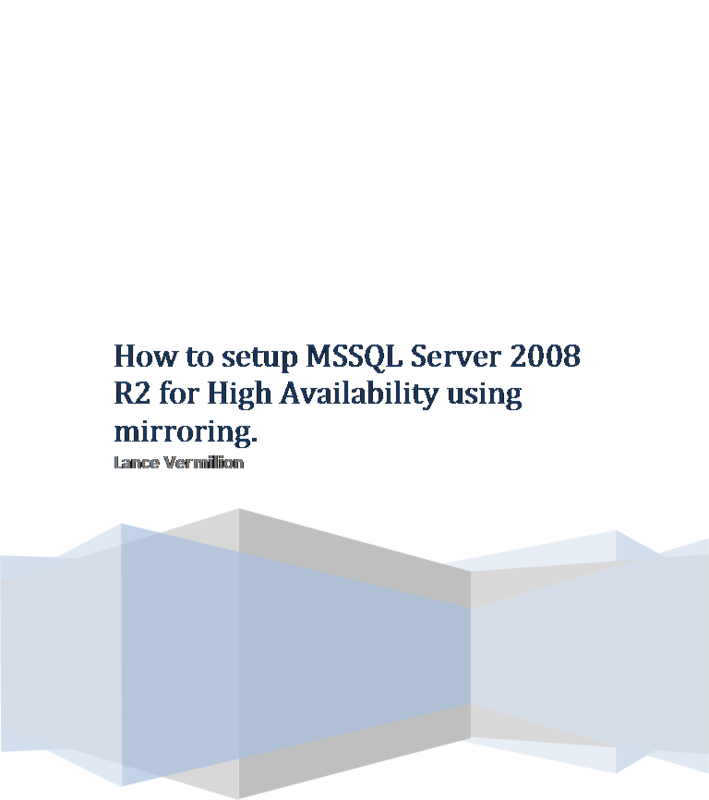 This document will only cover how to setup database mirroring with manual failover in synchronous high-safety mode between two server running Microsoft MSSQL Server 2008 R2. 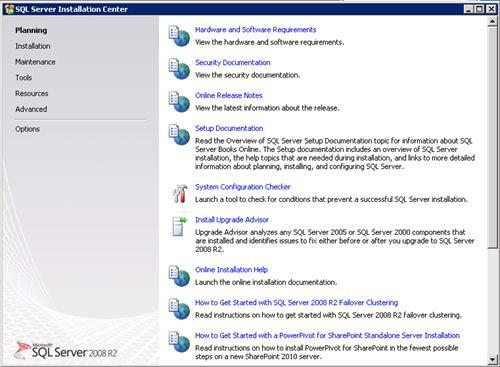 · Microsoft Server 2008 R2 Software to perform the install. · The two servers are in a workgroup and NOT a domain. · The two servers are on the same IP network. · Remote access has been setup for Administrator. · Access to the administrator account. WARNING: I have removed the server name from all images so make sure you pay close attention to what server you are connected to. 1. Make sure you have Microsoft .NET Framework 3.5 installed before you proceed. 2. 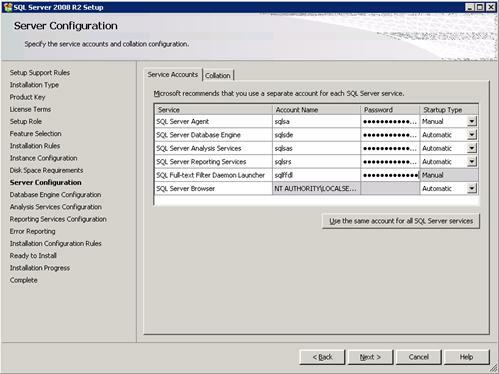 Create the Service Accounts that will be used for each MSSQL process. b. Use the table below for an example of the user names that need to be created for each SQL Service Account and what check boxes should be checked. You can use different passwords for each or the same one. Make sure you uncheck “User must change password at next logon”. 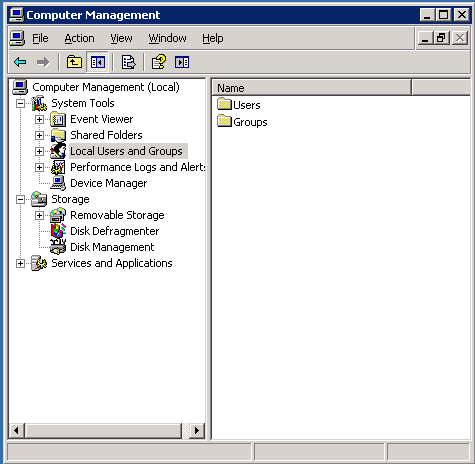 c. Right click “Users” under “Computer Management (Local)”->”System Tools”->”Local Users and Groups” and left click “New User”. d. Below is a table that provides some recommend SQL Service Account names and the groups which they should belong to. The assignment to each group will be done during installation. If you don’t do it at installation you can do it afterwards, but it is a bit more complicated. 3. 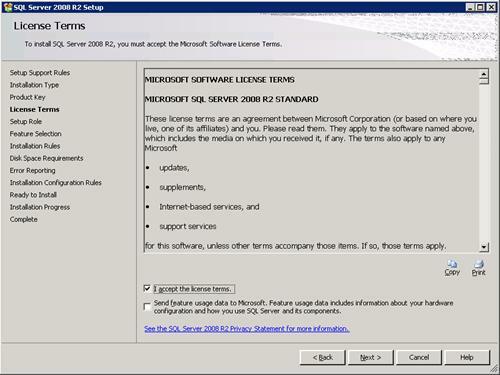 The group membership bit you will not be able to do at this stage since these groups get created when you install Microsoft MSSQL Server 2008. You can see the memberships that should exists after installation if you look at the table above. 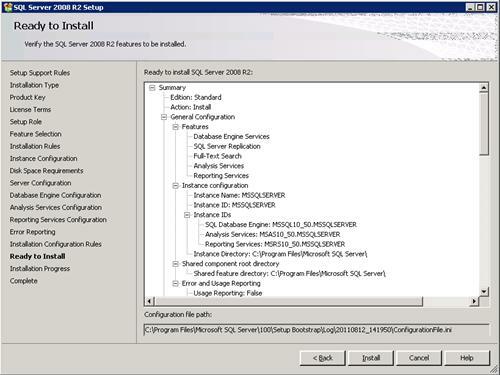 Let’s begin the install now we have SQL Service Accounts. 1. Locate the “Setup” file and double click it. 2. It is recommended to run “System Configuration Checker” before going forward, but not required. 3. This is the output from the “System Configuration Checker”. 4. 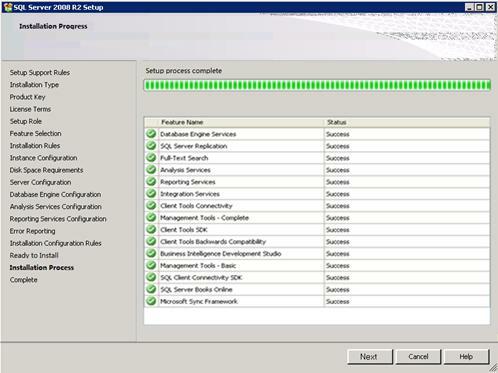 After you have verified you meet all the requirements for “System Configuration Checker” click “Installation” on the left. On the right side click “New installation and add features to an existing installation”. 5. The first thing that happens is the install does some checks. 7. Some more checks. Click “Next”. 8. Enter your “Product key” and click “Next”. 9. Check “I accept the license terms” and click “Next”. 10. 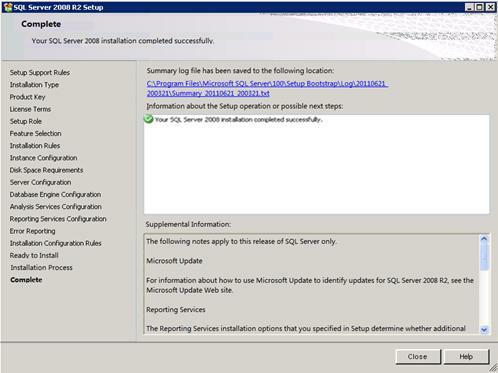 Choose “SQL Server Feature Installation” and click “Next”. 11. Click “Select All” and then click “Next”. 12. Yet another set of checks. Click “Next”. 13. Select “Default instance” unless you want to specifically name your instance. 14. Disk Space check is preformed. If you have enough space click “Next”. 15. This is where we use the SQL Service Accounts we created earlier. Refer to the table at the beginning of the section to properly populate these account names. 16. 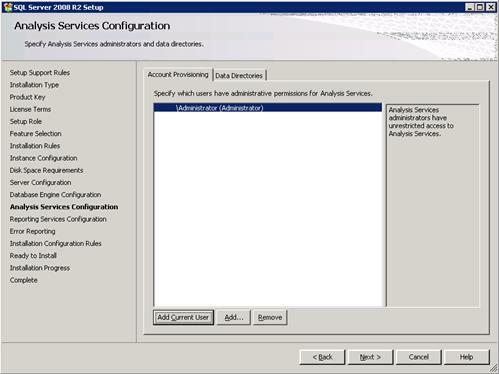 Choose “Mixed Mode (SQL Server authentication and Windows authentication)”, click “Add Current User”, and then click “Next”. 17. Click “Add Current User”, and then click “Next”. 18. Make sure “Install the native mode default configuration” and click “Next”. 20. Yet again we have more checks done. Click “Next”. 21. Click “Install” to do begin the actual installation process. 22. At the end of “Installation Process” click “Next”. 23. If everything went good you should have a similar screen. Click “Close” to finish. Database mirroring is a primarily software solution for increasing database availability. Mirroring is implemented on a per-database basis and works only with databases that use the full recovery model. Database mirroring provides complete or almost complete redundancy of the data, depending on whether the operating mode is high-safety or high-performance. In the event of a disaster, the database administrator has the alternative of forcing service (with possible data loss) to the standby copy of the database. · Improves the availability of the production database during upgrades. One of them, high-safety mode supports synchronous operation. Under high-safety mode, when a session starts, the mirror server synchronizes the mirror database together with the principal database as quickly as possible. As soon as the databases are synchronized, a transaction is committed on both partners, at the cost of increased transaction latency. The second operating mode, high-performance mode, runs asynchronously. The mirror server tries to keep up with the log records sent by the principal server. The mirror database might lag somewhat behind the principal database. However, typically, the gap between the databases is small. However, the gap can become significant if the principal server is under a heavy work load or the system of the mirror server is overloaded. 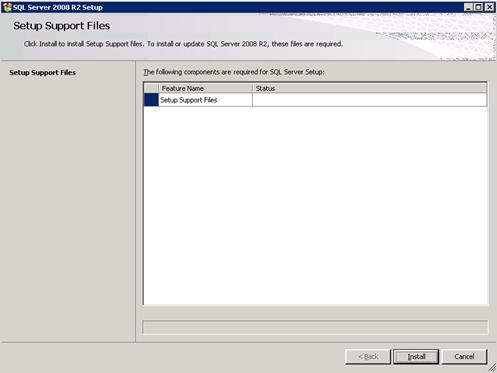 This mode requires MSSQL Server 2008 Enterprise. This document will only cover how to setup/administer the synchronous high-safety mode. Whether an operating mode is asynchronous or synchronous depends on the transaction safety setting. 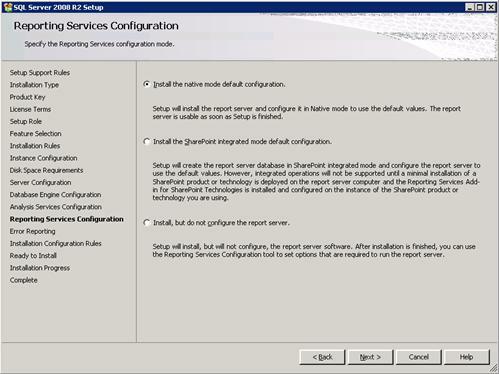 If you exclusively use SQL Server Management Studio to configure database mirroring, transaction safety settings are configured automatically when you select the operation mode. 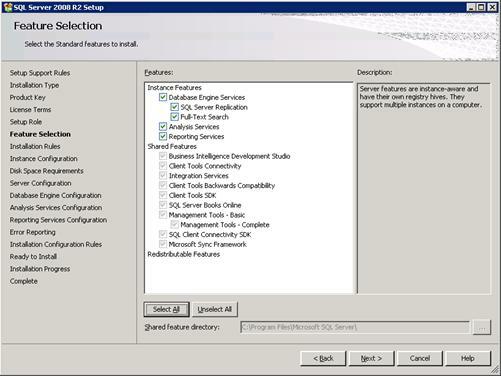 Since SQL Server Management Studio is used in this document the end result will be synchronous. If the SAFETY option is set to FULL, database mirroring operation is synchronous, after the initial synchronizing phase. If the SAFETY option is set to OFF, database mirroring operation is asynchronous. The session runs in high-performance mode. All database mirroring sessions support only one principal server and one mirror server. The following figure shows the configuration of synchronous high-safety mode without automatic failover. The configuration consists of only the two partners. This configuration is shown in the following illustration. When the partners are connected and the database is already synchronized, manual failover is supported. If the mirror server instance goes down, the principal server instance is unaffected and runs exposed (that is without mirroring the data). 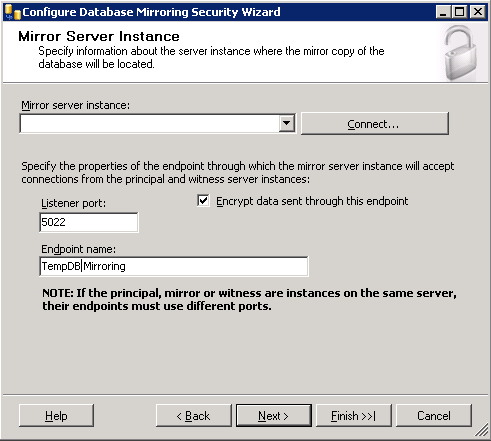 If the principal server is lost, the mirror is suspended, but service can be forced to the mirror server (with possible data loss). 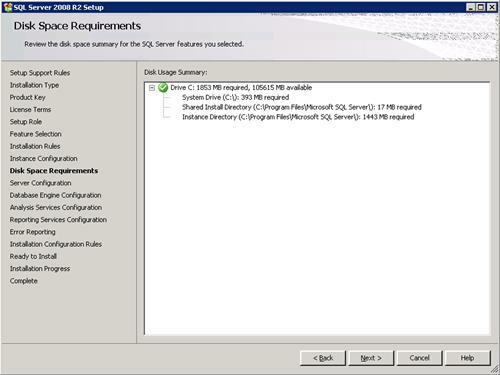 Establishing a new mirroring session requires that all involved server instances run the same version of SQL Server. The role of the witness is to verify whether a given partner server is up and functioning. The witness role is not discussed further in this document. 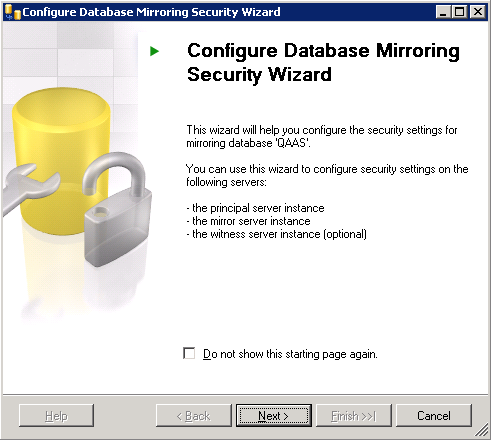 To configure mirroring you will need to have two databases that are identical. If you have not preformed a backup of your database you will want to follow these short steps. 1. 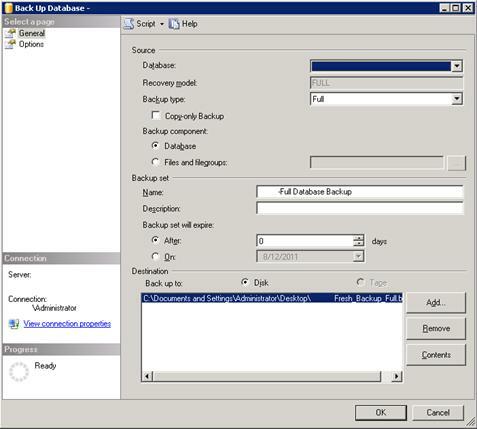 Right click on your database in the “Object Explorer”, go to “Tasks”, and click on “Backup…”. 2. In the “Source” section select your “Database” in the dropdown. In the “Backup set” section give the backup a name and provide a description if you like. In the “Destination” section click “Add” and pick a location for your backup to be saved to. The backup file name needs to end in “.bak”. Click “Ok” to start the backup. 3. 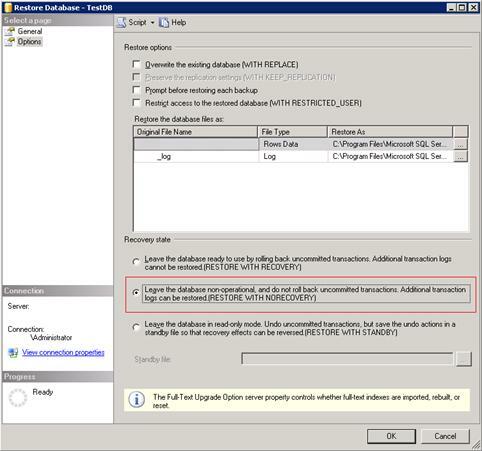 Repeat Steps 1-2 but in the “Source” section change the “Backup Type” to “Transactional” and in the “Destination” section use the same file you used for the Full backup (the default backup setting is “appended to the backup file”). 4. Copy the backup file you just made or created before to the server that will start out as the “mirror server”. 1. Create a database/transactional log backup on the Principal server. The default database recovery model is “Simple” but we want “Full”. 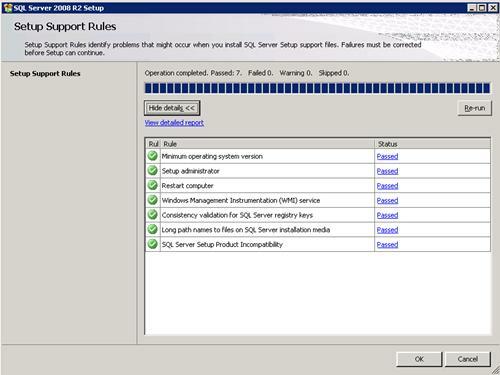 On the Principal server set the recovery type for each database you wish to mirror. 2. Backup the Database on the Principal Server. Backup the log database too. Copy the backup file over to the Server2 that we want to be the Mirror server. 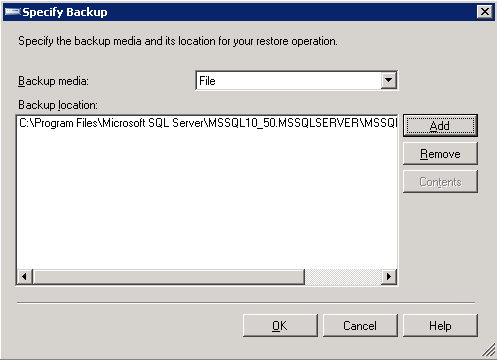 Restoring a Backup Copy of the Principal Server’s Database on the Mirror Server. 1. 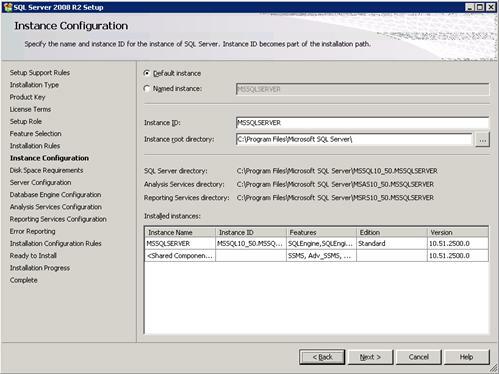 Open “Microsoft SQL Server Management Studio” on the “mirror server”, right click “Databases”, and left click “Restore Database…”. 2. 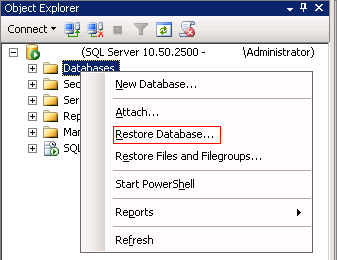 In the “Destination for restore” section populate the “To database:” box with the exact same database name that you preformed the backup on, on the principal server. In the “Source for restore” section click the radio button “From device:” and click the button on the far right. 3. You should get a “Specify Backup” window. Click “Add”, locate the backup file you copied to this server, and click “Ok”. Click “Ok” one more time. 4. You should be back to the “Restore Database – <database name>” window. If you are you need to check the box in the restore column for the file you just finished added. On the left hand window under “Select a page” click “Options”. Make sure you select the transactional log and the full backup. 5. 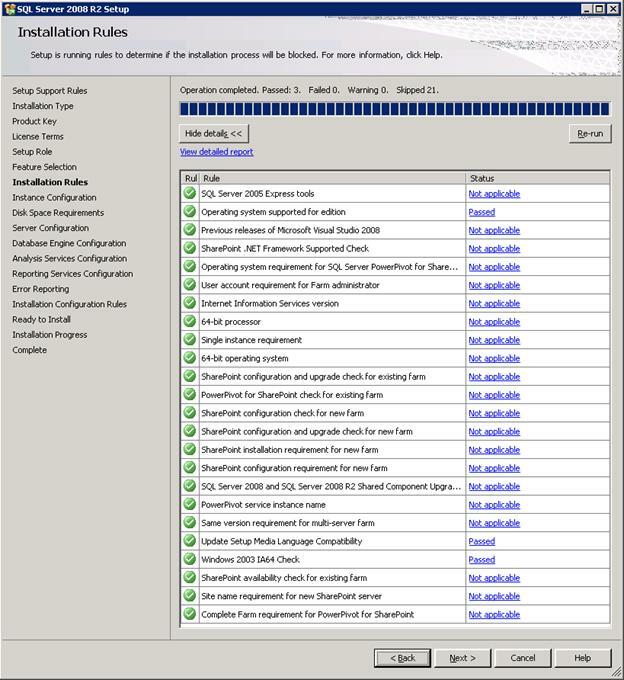 In the “Recovery state” section click the radio button for “Leave the database non-operational, and do not roll back uncommitted transactions. Additional transaction logs can be restored. (RESTORE WITH NORECOVERY)” and click “Ok”. 6. 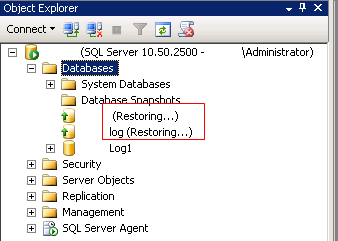 You should now see your databases in a state of “Restoring”. 1. Restore database/transactional log backups. We are going to assume you have copied it over to Server2 and have it in the root of the C: drive. Restore the log database too. 1. If you are not already on the Principal server login now. 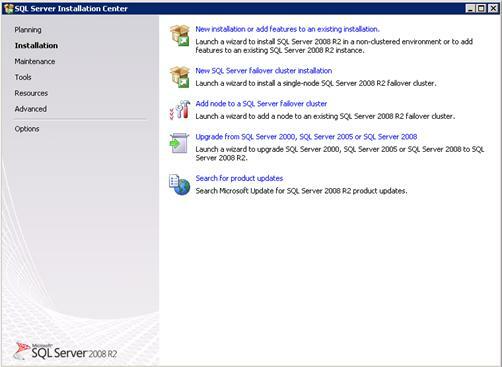 Open “Microsoft SQL Server Management Studio” and click on the plus symbol next to “Databases”. The database(s) we are going to be mirroring should be visible. 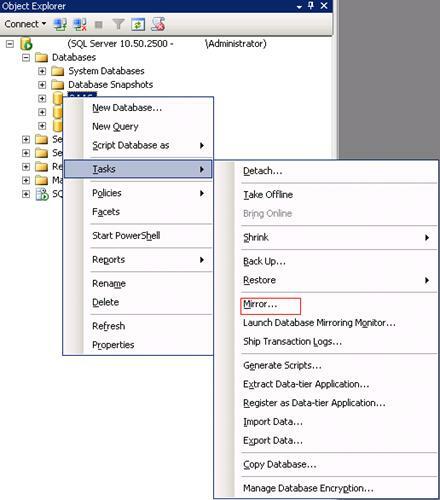 Right click on the database you want to setup database mirroring. Go to “Tasks” and then to “Mirror…”. 2. Click on “Configure Security”. 4. 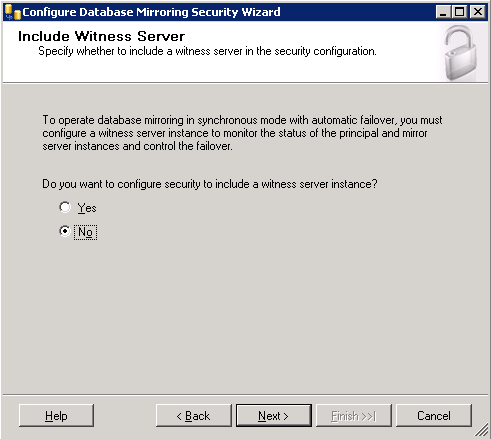 Choose the radio button “No” because we will not be using a witness server. Click “Next”. 5. The dropdown “Principal server instance” is likely already selected to be the name of the server you are connected to and if not make sure it is. I used the default port “5022” for the “Listener port” but you can use a different port. If you have a firewall enabled on your servers that will be the Principal/Mirror server you will want to disable it first to make sure everything comes up. 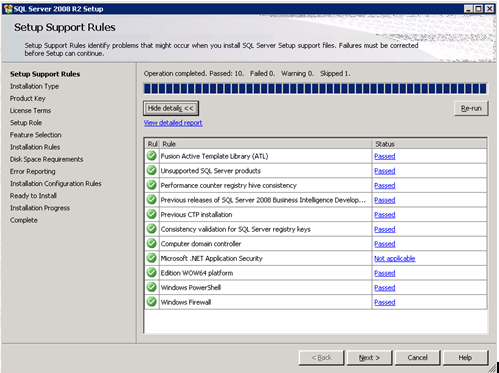 After everything is working you can enable it again and troubleshoot your rules by allowing the proper ports (i.e. 5022,etc). Check “Encrypt data sent through this endpoint”. The “Endpoint name” is a friendly name so name is so it makes sense to you. I normally name it like so <mirror server hostname> <DatabaseToMirror> Mirroring (i.e. 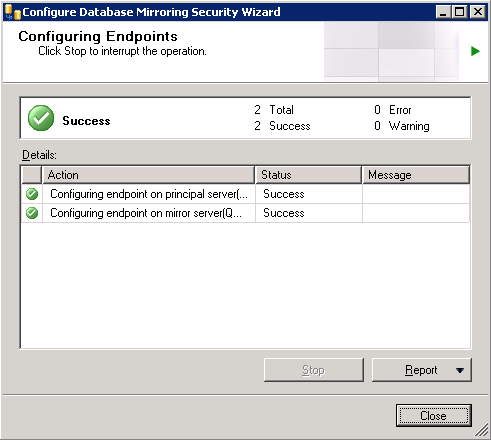 Server2 TempDB Mirroring). 6. The dropdown “Mirror server instance” needs to be set to the name of the mirror server. After setting it click connect. The “Endpoint name” is a friendly name so name is so it makes sense to you. I normally name it like so <PrincipalServerHostname> <DatabaseToMirror> Mirroring (i.e. Server1 TempDB Mirroring). 7. Leave all of these boxes blank and click “Next”. 9. MSSQL will create a Data Mirroring object under “Server Objects”->”Endpoints”->”Database Mirroring” on the Principal and Mirror servers and make the necessary database changes. If those changes are done successfully you should have a screen similar to what I have below. 10. You will receive a warning similar to the one shown below. 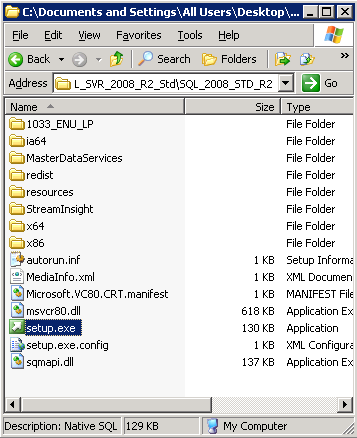 Click “Start Monitoring” to tell MSSQL to attempt to initiate/complete the mirroring connection. 11. Click “Yes”. MSSQL is just warning you that you are not using a Fully Qualified Domain Name (FQDN). 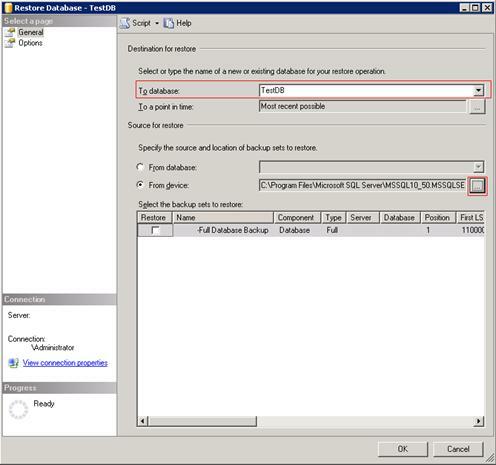 To use a FQDN you need to connect to everything using a FQDN via “Microsoft SQL Server Management Studio”. This also means you need to have a domain setup. This guide is intended for setup outside a domain. 12. If mirror was setup successfully you wil see the status window now says “Synchronized: the databases are fully synchronized.” If you have the same status I have described you can click “Ok”. If you do not you will need to trouble shoot the issue. 13. 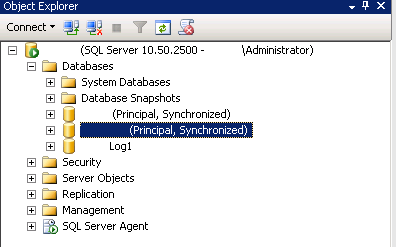 You should now see the following status “Principal, Synchronized” on the “Principal Server”. 14. 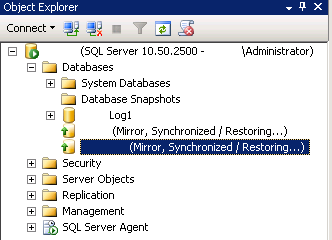 You should now see the following status “Mirror, Synchronized / Restoring…” on the “MIrror Server”. The Database monitoring default interval is 1 minute. Only content within the principal database is mirrored. Associated information in the master or msdb system databases cannot be mirrored. Such associated information includes jobs set up against the principal database and logins that are added to the principal server. If such information is important to supporting role switching, the information should be duplicated at the mirrored site. If it is possible, after roles are switched it is best to programmatically reproduce the information on the new principal database. The most common issues are logins and jobs. 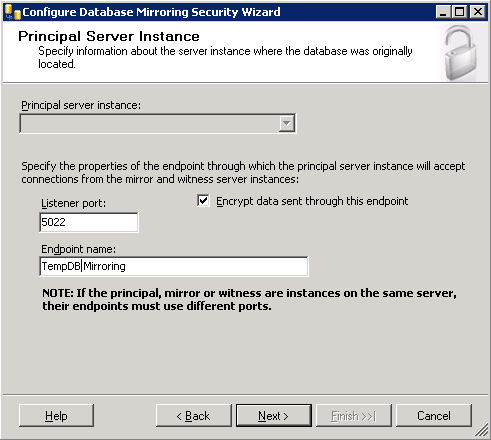 For users to be able to access the database after a role switch, a login on the principal server that has permission to access the principal database, must also be defined on the mirror server. However, the master database cannot be mirrored. Therefore, if on the current principal server, you create a new login to this login for the principal database, you must do the same on the mirror. The login of every user of the database must be manually defined on the mirror server and on the principal server. 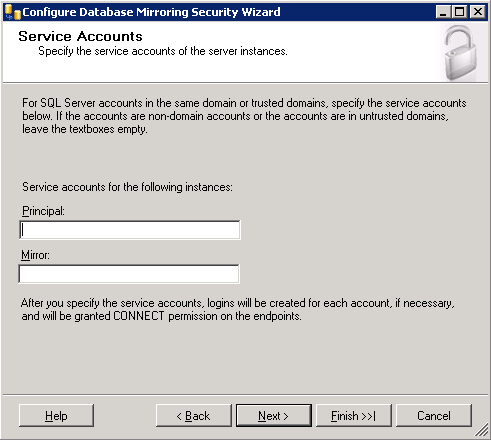 Otherwise, when the principal role switches and the former mirror server offers its database as the principal database, users whose logins are not defined on the former mirror cannot access the new principal. The users are orphaned. Jobs, such as backup jobs, require special consideration. Typically, after a role switch, the database owner or system administrator must re-create the jobs for the new principal database. When the former principal server is available, you should also delete the original jobs from the new mirror database. Jobs on the mirror database fail because it is in the RESTORING state and so it is unavailable. The partners might be configured differently, with different tape drive letters or such. The jobs for each partner must allow for any such differences. Throughout a database mirroring session, the server instances monitor each other. The partners use the mirroring state to monitor the database. With the exception of the PENDING_FAILOVER state, the principal and mirror database are always in the same state. SYNCHRONIZING The contents of the mirror database are lagging behind the contents of the principal database. The principal server is sending log records to the mirror server, which is applying the changes to the mirror database to roll it forward.At the start of a database mirroring session, the database is in the SYNCHRONIZING state. The principal server is serving the database, and the mirror is trying to catch up. SYNCHRONIZED When the mirror server becomes sufficiently caught up to the principal server, the mirroring state changes to SYNCHRONIZED. 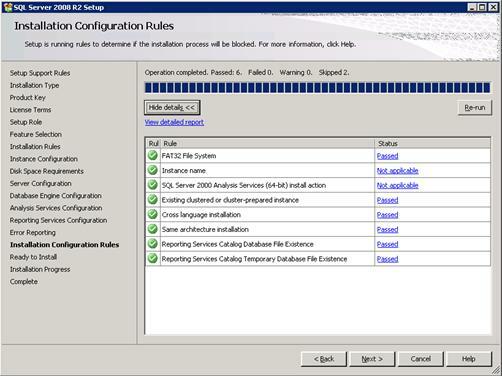 The database remains in this state as long as the principal server continues to send changes to the mirror server and the mirror server continues to apply changes to the mirror database.If transaction safety is set to FULL, automatic failover and manual failover are both supported in the SYNCHRONIZED state, there is no data loss after a failover.If transaction safety is off, some data loss is always possible, even in the SYNCHRONIZED state. SUSPENDED The mirror copy of the database is not available. The principal database is running without sending any logs to the mirror server, a condition known as running exposed. This is the state after a failover.A session can also become SUSPENDED as a result of redo errors or if the administrator pauses the session.SUSPENDED is a persistent state that survives partner shutdowns and startups. PENDING_FAILOVER This state is found only on the principal server after a failover has begun, but the server has not transitioned into the mirror role.When the failover is initiated, the principal database goes into the PENDING_FAILOVER state, quickly terminates any user connections, and takes over the mirror role soon thereafter. 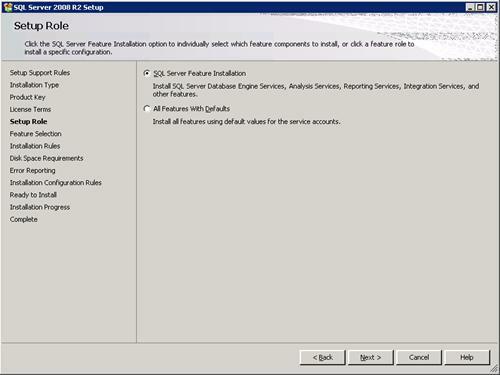 To manually failover the database between the principal and mirror server you will need do the following. 1. If you are not already on the Principal server login now. 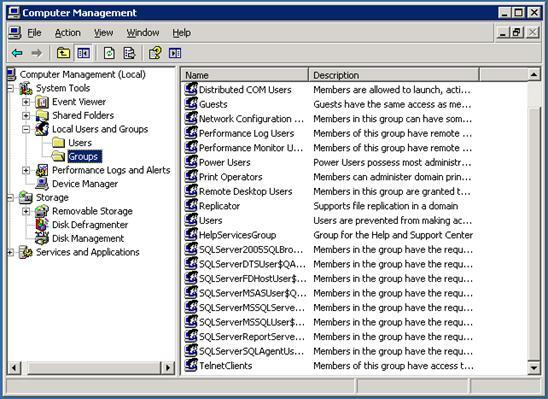 Open “Microsoft SQL Server Management Studio” and click on the plus symbol next to “Databases”. The database(s) we are mirroring. Right click on the database you want to failover to the mirror server. Go to “Tasks” and then to “Mirror…”. 2. If you simply click the button “Failover” the failover will happen. If you are mirroring the log database for your database you will want to failover that database first (i.e. database = TempDB, database log = TempDBLog). When the mirrored database is synchronized (that is, when the database is in the SYNCHRONIZED state), the database owner can initiate manual failover to the mirror server. Manual failover can be initiated only from the principal server. On the principal server first we will set the database context to the master database and then initiate an immediate transition of the mirror server to the principal role. On the former principal, clients are disconnected from the database and in-flight transactions are rolled back (meaning lost). Failover any <DatabaseName>Log databases first. Failover the main database after you have successfully failed over the Log database. Forced service is strictly a disaster recovery method. Forcing service may involve some data loss. Therefore, force service only if you are willing to risk losing some data in order to restore service to the database immediately. If forcing service risks losing significant data, we recommend that you stop mirroring and manually resynchronize the databases.Forcing service suspends the session and starts a new recovery fork. The effect of forcing service is similar to removing mirroring and recovering the former principal database. However, forcing service facilitates resynchronizing the databases (with possible data loss) when mirroring resumes. We are going to assume Server1 (Principal Server) is dead and now we want to change Server2 (currently in a mirror mode) into a “Principal Server”. To do this we will have to execute a SQL Query because I cannot find any documentation on how to do it within “Microsoft SQL Server Management Studio”. 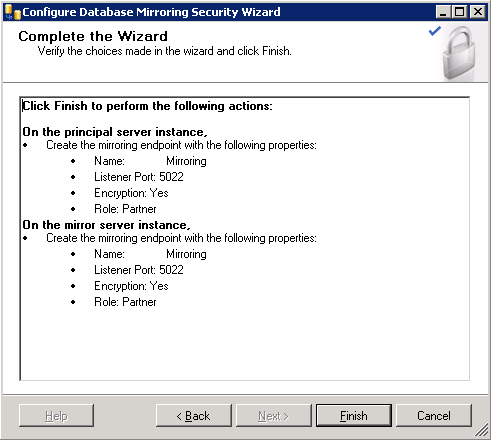 The mirror server immediately transitions to principal server, and mirroring is suspended. This will create an output similar to this. The “Table2 Name” is just a distinct list from the name field of table2 table.